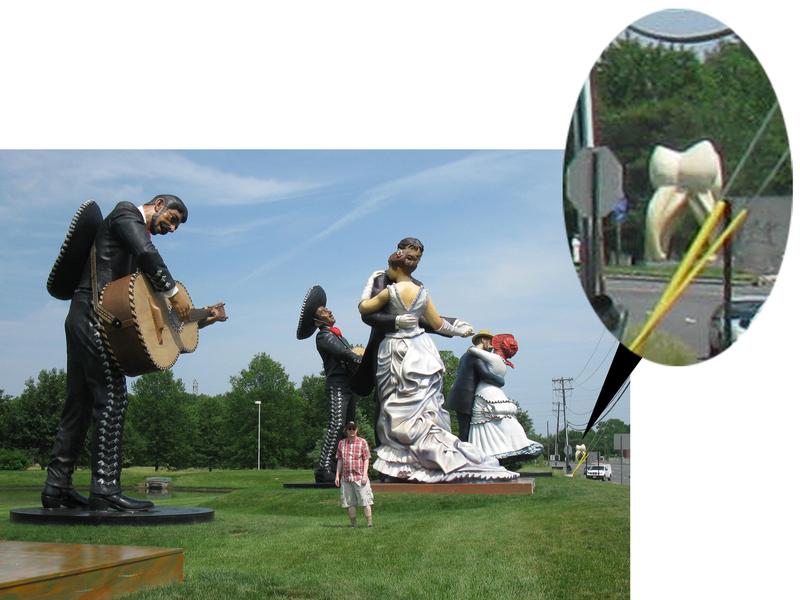 Just down the road from the tooth are some fantastic sculptures of Mariachi musicians and dancers. That's an average-sized dope posing in front for a sense of scale. In Trenton, New Jersey, just a stone's throw from the really big American Gothic statue we blogged about recently, sits another of sculptor-of-kooky-and-really-huge-subject-matter-extraordinaire Seward Johnson's kitschy roadside marvels: the world's largest tooth. 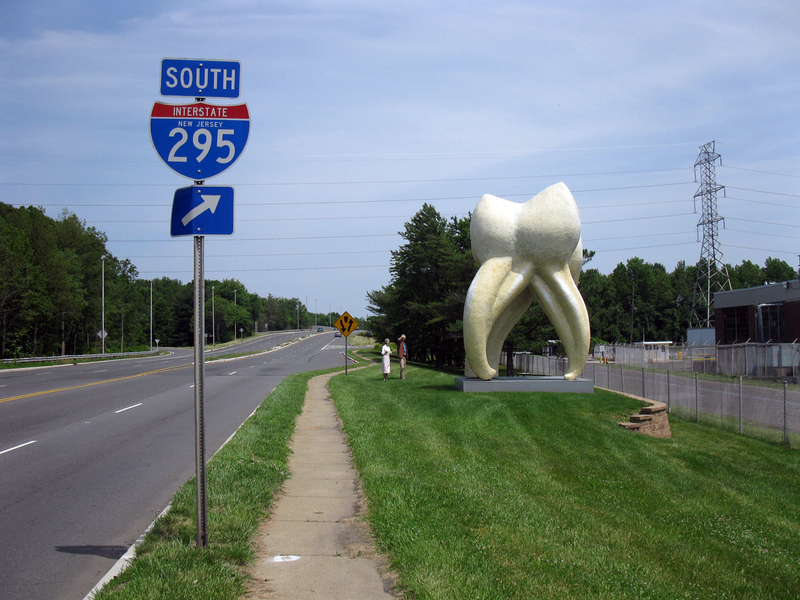 Measuring in at around 15 feet tall, it sits gleaming in front of the Congoleum Company building and near the on-ramp to I-295 South, with nary a trace of tartar on it. 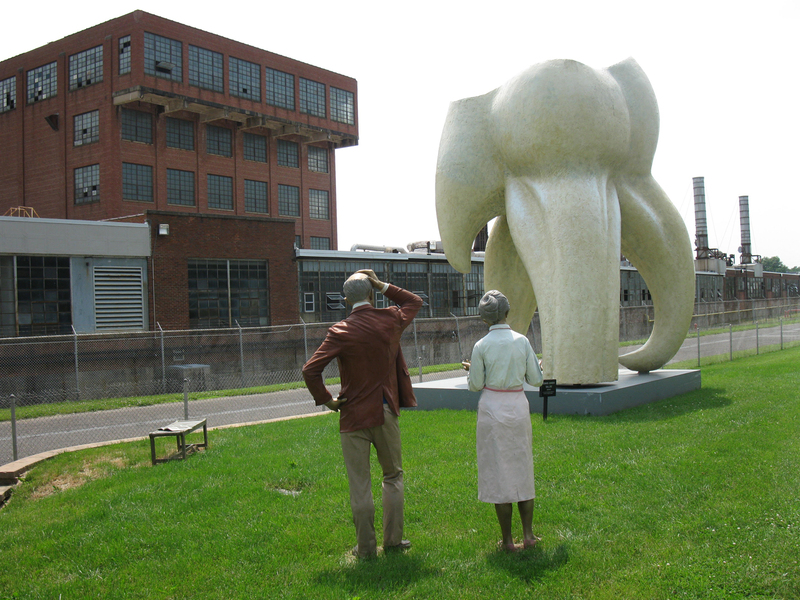 And like he did with the American Gothic, Johnson has added a sculpture of a bemused, normal-sized couple gawking nearby, to give passersby a sense of the ridiculous scale of the tremendous tusk. 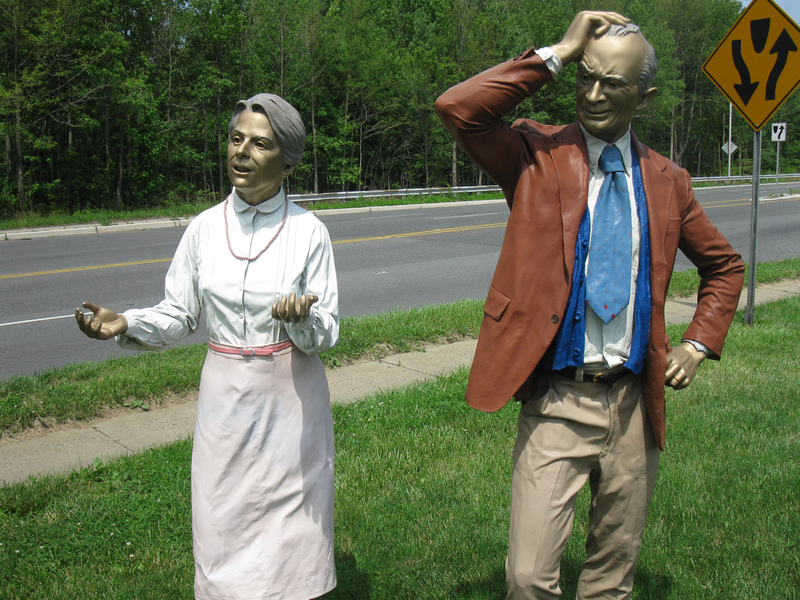 How great it must be to be Seward Johnson, heir to the Johnson & Johnson pharmaceutical fortune, to have the wealth and talent to dot the landscape with all your crazy creations. Just down the street is his group of enormous Mariachi musicians and dancers. Why? You need a reason? Art doesn't have to say something all the time and hurt your head. Sometimes it's nice to give bored motorists a laugh and a smile. 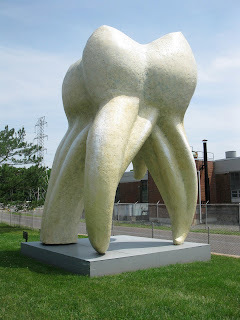 And that's the tooth. But wait, there's more bad puns: To Mr. Johnson, we'd like to say fangs for the memories, we're abscessed with your work, there ought to be a plaque in your honor, do you work on retainer?, we're all up in your grill, we'll be your en-dentured servants, you're like a bridge over troubled water, we've grown bicuspid to your face and we're at a floss for words, dad gummit. I enjoy unexpected sights and this is an amusing one. It's not, however, art. 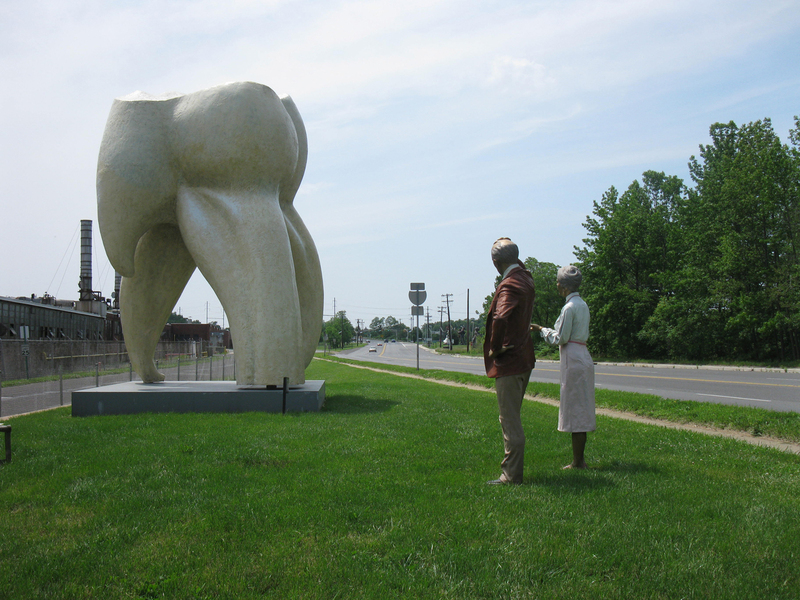 Art critic Robert Hughes described Johnson's sculptures as not being art and I agree. There's a fascinating story about Johnson's father who, near the end of his life, married his young Polish housekeeper and wrote all of his kids (including Johnson) out of his Will. The Will was challenged and the tale of that litigation was beautifully told in "Undue Influence," the best book about law ever written. Your sense of humor with what you find along the road is pretty engaging. I'm another fan of all things vanishing, so am following your blog now! Shybiker: I don't know Art, but I always enjoyed him as Ed Norton on "The Honeymooners"! Thanks for stopping by. Did not know about Mr. Johnson's background...interesting! Jann: Thanks for stopping by! Hi again, found your Route 66 blog while looking for contributors to my Time Traveling weekly and kudos to you, it's great (as I mentioned before)! I wanted to share my latest post on my "What's Vanishing Next?" blog with you, where I included your site and links. Didn't think I'd bite on this one, but I did! This could be your crowning achievement! This was removed (extracted?) a few months ago. The building behind it has also been demolished. If you enjoyed the sculptures along the roadside you should visit GROUNDS FOR SCULPTURE in Hamilton, NJ next time you're in the area. 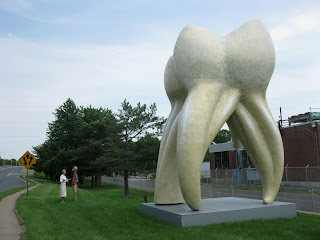 Seward has a beautifully manicured sculpture park & arboretum!